Passivation treatment improves the surface condition of stainless steel by dissolving iron that has been imbedded in the surface during forming or machining. If iron was allowed to remain, it can corrode and give the appearance of rust spots on the stainless steel. Passivation is used for equipment and surfaces in the food and drug manufacturing industry. 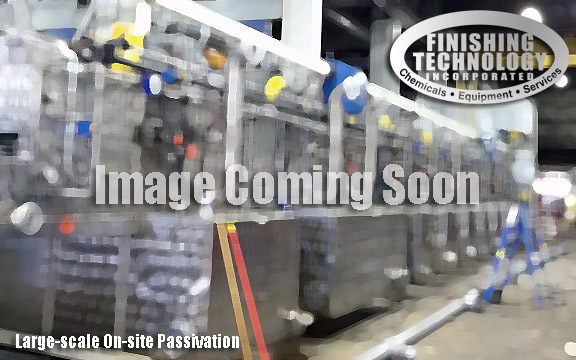 If you’re looking for the right plan, chemistry, equipment and an experienced team for a challenging on-site passivation project, contact Fred Warmbier at Finishing Technology at 513-563-4333 or sales@finishing-technology.com. Certifications for Passivation Specification ASTM 967, are available upon request. With our experienced work teams, proprietary chemistries, mobile equipment and safety practices; Finishing Technology has earned a national reputation for tackling challenging, on-site passivation projects, regardless of size or scope. Recently, Finishing Technology completed large-scale on-site passivation projects for two FORTUNE 50 companies; one a multinational pharmaceutical corporation, the other an international beverage company. For the pharmaceutical corporation, Finishing Technology created a detailed plan to passivate six manufacturing vessels which included the heating coils and all the piping systems that supply these tanks. Personnel from Finishing Technology provided all the chemistry, pumping, piping and safety equipment to complete the passivation process, conduct surface testing and put the tanks back into service – with all work completed over a challenging weekend. For the beverage corporation, Finishing Technology conducted the passivation for a large beverage container wash unit. Working closely with the general contractor that installed the system, Finishing Technology provided all the chemistry, pumping, piping and safety equipment; and afterwards provided the surface testing. This on-site project required two days to complete. For more information on our passivation capabilities, we invite you to read the articles in our “In-the-News” section of this website that add more detail on several large-scale on-site projects that we recently completed. Although, we have confidential agreements with our clients and cannot name the company names, you can see these projects were large, complex and successfully completed.